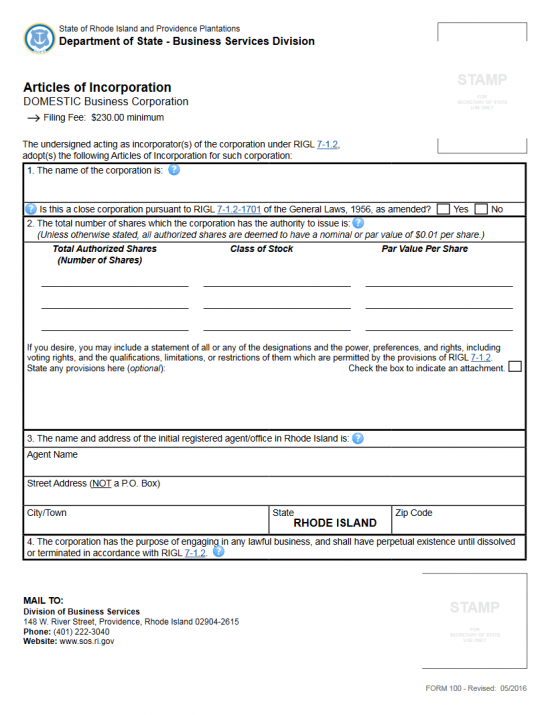 The Rhode Island Articles of Incorporation – Business Corporation | Form 100 is a template form supplied by the Rhode Island Secretary of State that Incorporators must fill out and submit in order to form a profit corporation in compliance with Rhode Island State Laws. 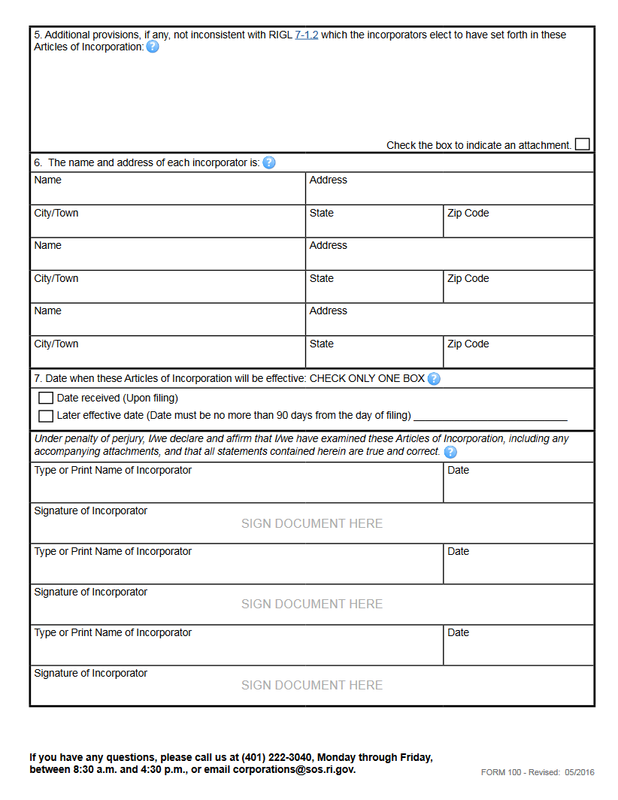 This form represents the absolute minimum information that all entities wishing to incorporate must submit however some entities will need to provide additional filings, documents, and, in the case of professional corporations, licenses or permissions. All requirements pertaining to the entity type being formed must be followed so, Incorporators are both encouraged and expected to perform their due diligence in researching the process including seeking a consultation with an attorney or accountant. 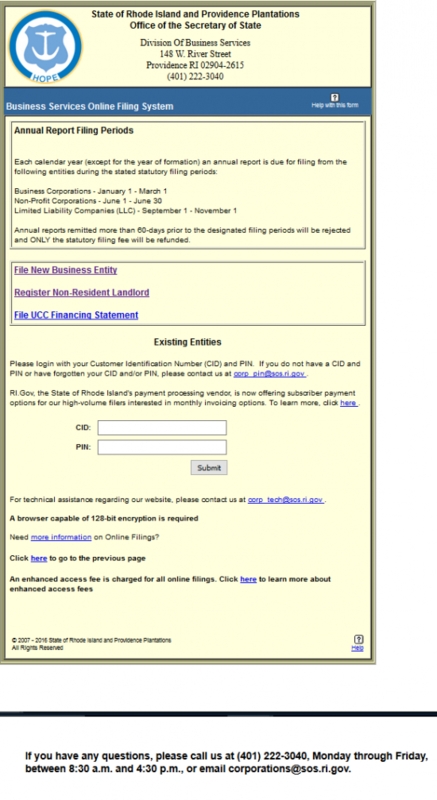 The Filing Fee for submitting the Rhode Island Articles of Incorporation – Business Corporation | Form 100 for corporations with less than 75 million shares is $230.00 (if your corporation has more than 75 million authorized shares, you must contact the Corporations Division of the Rhode Island Secretary of State). This fee may be paid for with a check made out to “Rhode Island Secretary of State” when filing by mail or it may be paid for with a credit card if it is filed online. If filing by mail, send your documents to Rhode Island Secretary of State,Division of Business Services,148 W. River Street, Providence, Rhode Island 02904-261. 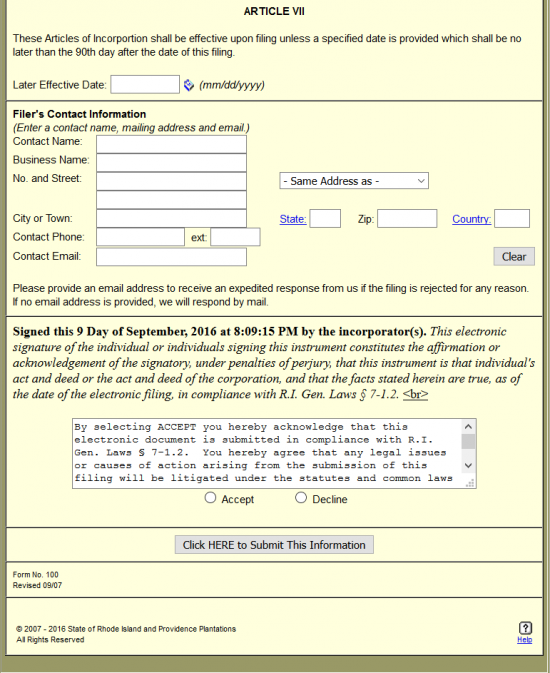 If filing electronically, you must obtain an account (free) and log in to do so through the Rhode Island Secretary of State here: www.sos.ri.gov. Step 1 - Download the Rhode Island Articles of Incorporation – Business Corporation or click here: Form 100. 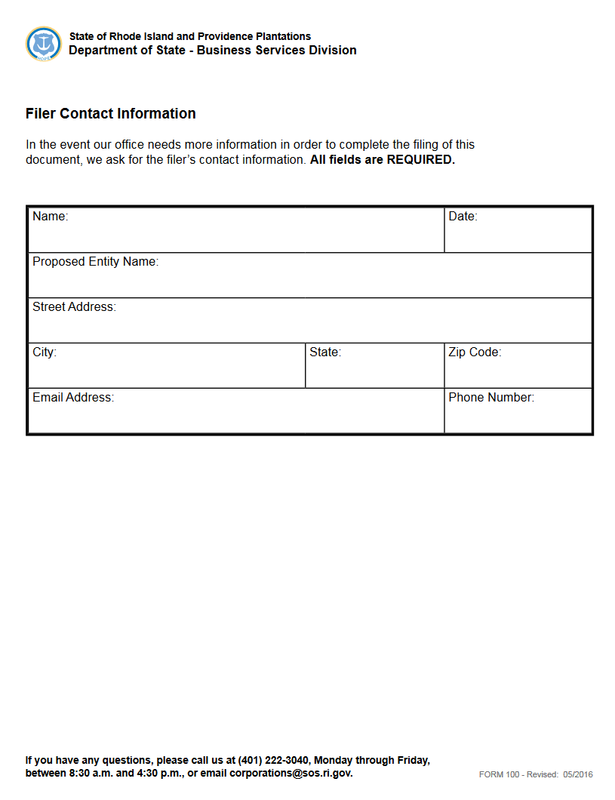 This form may be edited with a PDF program onscreen then produced with a printer or it may be produced then filled out with a type writer. If it is illegible, it will be rejected. Step 3 - In Article 2, you must report the Total Number of Authorized Shares at the disposal of this corporation in the column labeled “Total Authorized Shares (Number of Shares) for each Class of stock. Report the Class of Stock for each total in the second column, “Class of Stock.” You should also report the Par Value Per Share for each Class of stock in the third column. Step 4 - The paragraph in Article 2, allows for any statements regarding power, preferences, rights, etc. to be documented. If there will be an attachment continuing this section mark the box labeled “Check the box to indicate an attachment” then attach the continuation on a clearly labeled sheet of paper. 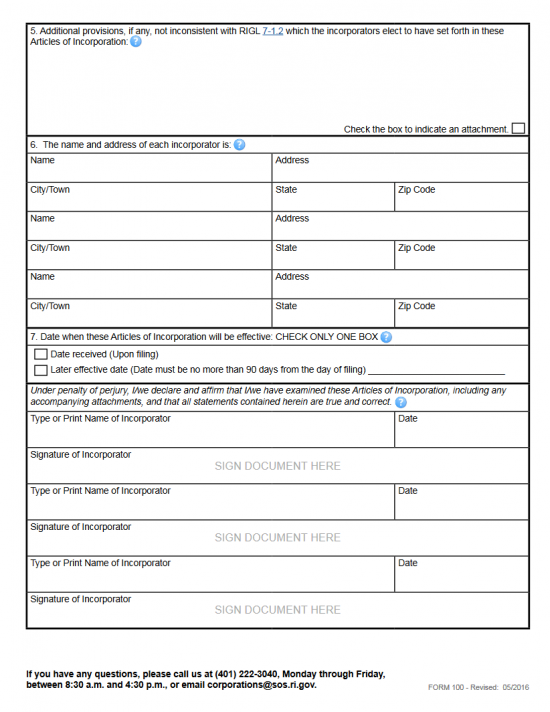 Step 5 - In Article 3, report the Full Name of the Registered Agent that has been acquired to receive court documents and certain notices from the Rhode Island Secretary of State on the blank line provided (labeled “Agent Name”). Step 6 - On the second blank line, in Article 3, the Street Address of the Registered Office must be reported on the blank line labeled “Street Address.” This must be comprised of a Building Number, Street, and, if applicable, Suite Number. Step 7 - On the third blank line, in Article 3, report the City/Town and Zip Code. Notice the State box is filled in. This is because the Registered Agent must maintain a Registered Office in the State of Rhode Island. Step 8 - Article 4 will bind this corporation to the Purpose stated. Read this statement carefully. 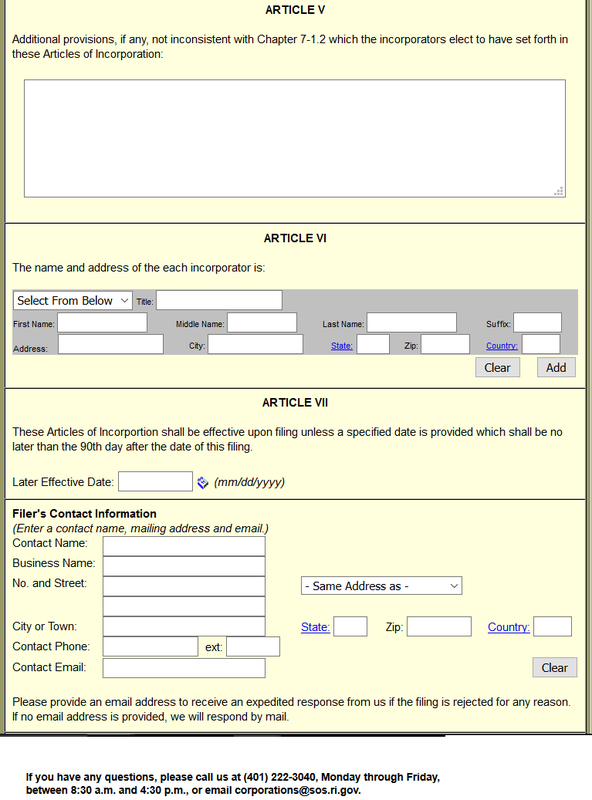 Step 10 - In Article 6, use the lines provided to document the Name and Full Address of each Incorporator. The first box will contain an area for the Incorporator Name. This will be followed by boxes for the Address (Building Number, Street, Suite), City/Town, State, and Zip Code. Step 11 - Article 7 will provide the option of having the articles go into effect upon the filing date or on a separate date within 90 days after the filing date. If you wish the articles to go into effect upon filing then mark the first box and move on to the next section. If you wish a specific effect date then mark the second box and enter the desired date on the space provided. Step 12 - The final area of this page will bind the Incorporators to the articles being submitted. Each Incorporator, listed in Article 6, must Print his/her Name, enter the Date of Signing then, below the Printed Name, provide his or her Signature. Step 13 - On the final page of this document, you will need to provide Contact Information the Rhode Island Secretary of State may use in the event questions or issues arise with this filing. Begin with the Name of this individual in the first box and the Date of the document in the second box. In the third box, enter the Proposed Entity Name exactly as it was entered in Article 1. In the fourth box provide the Street Address of the Contact. Then the City, State, and Zip Code in the following three boxes. Finally on the last line, provide a valid Email Address and the Telephone Number of the Contact. Note this address will not be used to deliver a final decision as to whether your articles are accepted or not. 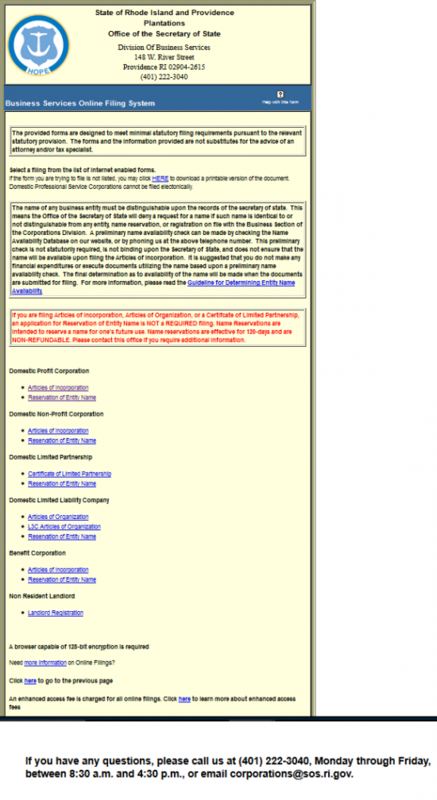 You must view the status on the Rhode Island Secretary of State. Step 14 - Once you have confirmed the information reported in these articles is true and accurate, you may gather all the required documents that must accompany the Rhode Island Articles of Incorporation – Business Corporation |Form 100 along with a check made out for $230.00 to the “Rhode Island Secretary of State” into an organized package then sen it to the Rhode Island Secretary of State Division of Business Services for approval. Step 1 - Go the Rhode Island Secretary of State Document Library here: http://www.sos.ri.gov/doc_lib/search/ribusinesscorporation. 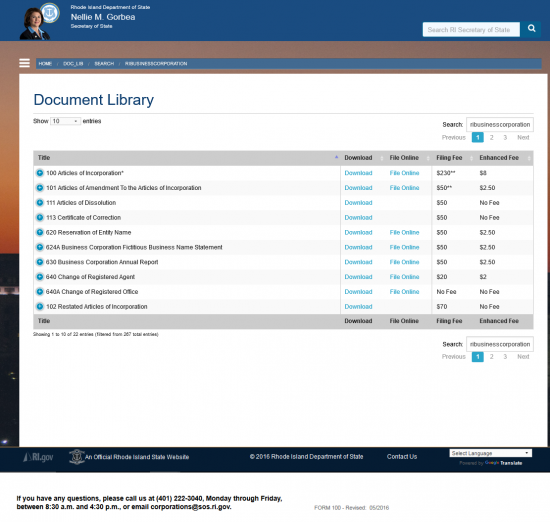 Step 2 - On the line beginning with the words “100 Articles of Incorporation,” select the “File Online” link. 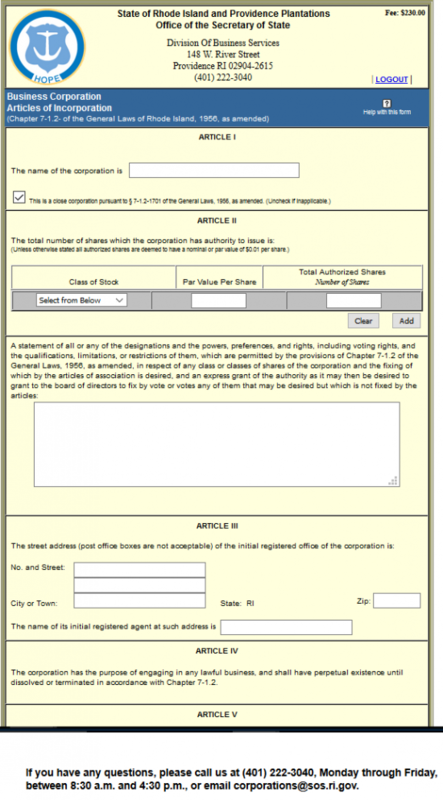 Step 5 – This is the Rhode Island Articles of Incorporation online form. To begin, locate the field labeled “The name of the corporation is” then enter the Full Name you would like your corporation to operate under including the a required word of incorporation. If this is a close corporation then mark the check box below this field. If not, do not place a check mark in the check box. 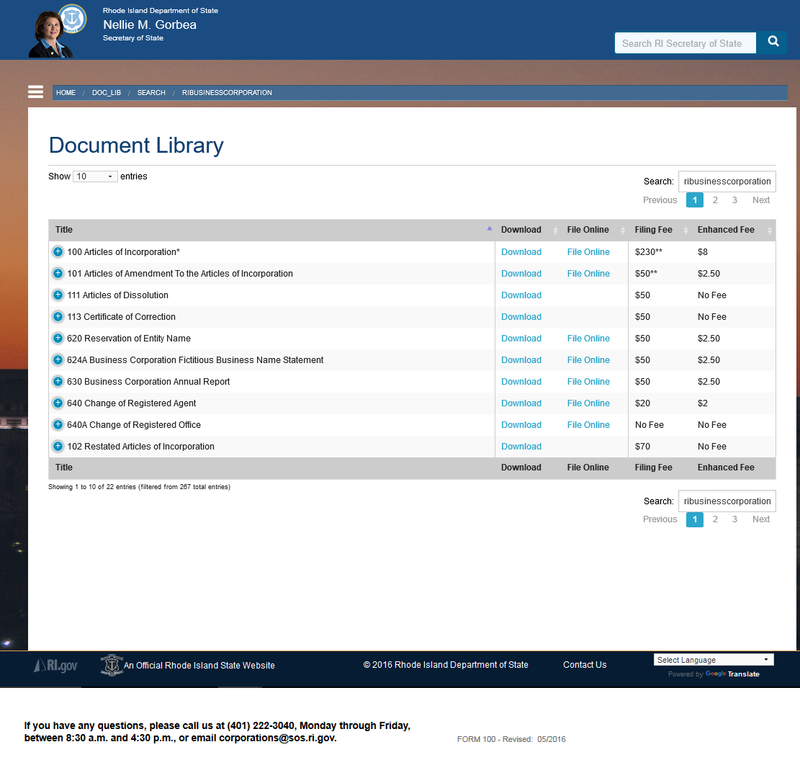 Step 6 – Article II will require information regarding the Authorized Stock Shares this corporation may dispense. Begin this report by selecting the type of stock from the drop down list in this section. At least one row should have a Stock Type selected, the Class of Stock reported, the Par Value Per Share reported, and Total Authorized shares documented. You may enter the Par Value Per Share and Total Number of Authorized Shares in the two text fields following the drop down list. When you are done with an entry select the “Add” button. This will display the stock information you entered in a table. You may delete any row once it has been entered, by placing a check mark in the box labeled “Delete” then selecting “OK” in the pop up window warning you are about to delete an entry. Step 7 - In the next section of Article II, you may report any, in regards to classes, any special privileges, responsibilities, preferences, limitations, liabilities, voting rights, etc. in the text box provided that should be included in these articles. Step 8 - Article IV binds the Incorporators (and the forming entity) to the Rhode Island’s definition of a corporate purpose. Step 9 - Article V will allow for any additional Provisions to be added. As mentioned before these articles will require the basic information that all corporations must report. Some corporations however, may need to document various Provisions, Conditions, or Rules at the time of formation. There will be a text box provided for this purpose in Article V.
Step 10 - Article VI requires the Full Name and Address of each Incorporator to be reported. Using the first field’s drop down list, select “Incorporator.” Then, in the second field, labeled “Title,” report the Title of the Incorporator being reported. Step 11 - Locate the fields labeled “First Name,” “Middle Name,” “Last Name,” and “Suffix” to report the Full Name of the Incorporator being reported. Step 12 - On the last line of this article, use the “Address,” “City,” “State,” Zip,” ” and “Country” fields to report the Full Address of the Incorporator being listed. Step 13 - If the Incorporators wish to delay the Effective Date to any date between the Filing Date and 90 days after the Filing Date, they may request this by entering the desired Date of Effect in the text box provided in Article VII. Step 15 - In the field labeled “No. and Street,” enter the Building Number, Street, and any applicable Suite Number, of the Contact Party’s Address, using the two fields provided. Step 16 - In the fields labeled “City or Town,” “State,” “Zip,” “Country” enter the City/State/Zip Code of the Contact Person. Step 17 - Read the final paragraphs of this document then click the radio button labeled “Accept.” This will give you an opportunity to review all the information you have entered, if it is true, select “Accept.” You will be given an opportunity to enter your credit card information. Currently, you may only use a credit card to make a payment and this filing will not be reviewed until a payment has been remitted.